When it's the kind of hot that much of the nation is experiencing today, I think back to a tropical vacation Mike and I took long ago. We had flown to Nassau, boarded a smaller plane for North Eleuthera, and then taken a boat to Harbor Island. It was boiling hot and steamy humid on that remote little dot of land in the Caribbean, yet pleasant with the cooling ocean winds. Silky pink sand, beautiful private beaches, and an ever-blowing sea breeze--that's what Harbor Island is all about. Before dinner hour at the hotel, signaled by a long blast on the conch shell, there'd be a variety of appetizers. As we sat in beach chairs at the water's edge and watched amazing cloud formations and the setting sun, I had my first bacon-wrapped date/pineapple concoction. It trumpets the salty/sweet taste combination everyone loves and has been on the Koulermos dinner party menu--in all kinds of weather--ever since. Preheat oven to 425 F. Cut the slab of bacon in half so that you're using a half strip of bacon for each roll-up. 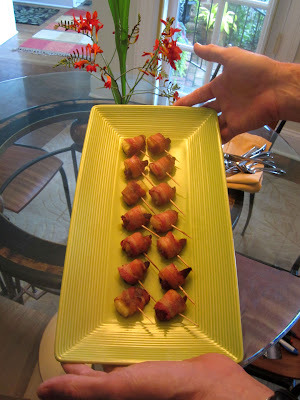 (A full strip of bacon has trouble cooking all the way through) Slice the pitted dates longways so that you're using a half date per roll-up. Get a little work station going, with a pile of toothpicks, the date halves, pineapple chunks, and half strips of bacon. 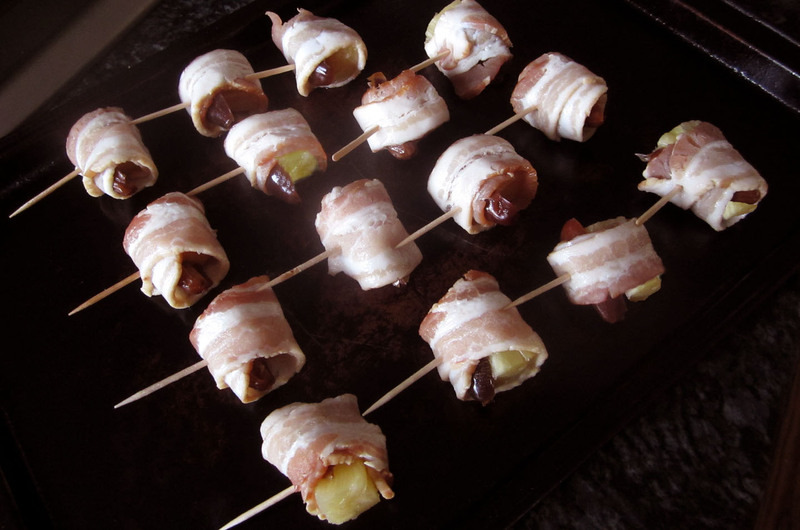 Put the half date on top of the pineapple chunk and roll it up in the bacon. Secure with a toothpick. Place on a cookie sheet. Bake on the top rack in the 425 F oven for 12 to 15 minutes, then take a look. From here on out, monitor progress until done, maybe another 5 or 10 minutes, making sure the bacon is done.